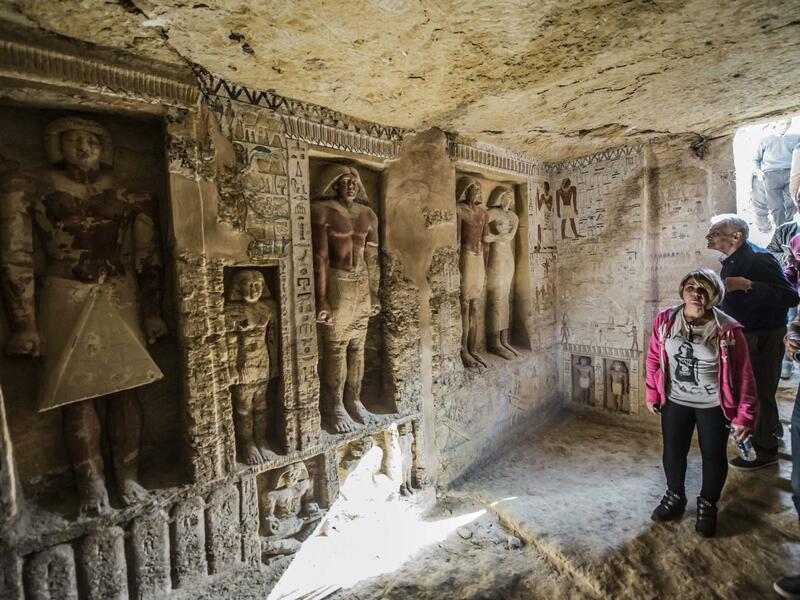 Visitors enter a newly-discovered Egyptian tomb at the Saqqara necropolis on Saturday. The entrance of the newly-discovered tomb, seen Saturday. An interior view of the tomb. "The color is almost intact even though the tomb is almost 4,400 years old," said Mostafa Waziri, secretary-general of the Supreme Council of Antiquities, according to Reuters. He told reporters the find was "one of a kind in the last decades." "Thousands of tombs are spread across an area nearly four miles long and nearly a mile wide, and covering more than 3,000 years of complex Egyptian history. 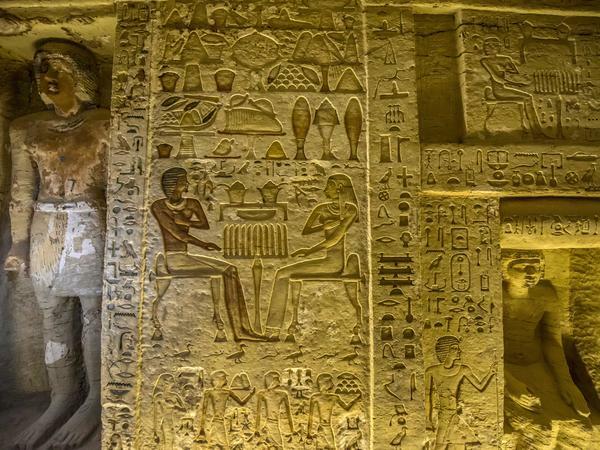 ... Saqqara has yielded some of antiquity's most compelling art and architecture, from the magnificent complex of Djoser, which set the standard for future pharaonic tombs, to intimate, carved stone friezes picturing some of the most moving scenes of daily life in ancient Egypt." The tomb uncovered this week dates from the reign of Fifth Dynasty Egyptian King Neferirkare Kakair, Reuters reports. The news site Egypt Today reports that the site honors Wahtye, a purification priest. It also details the collection of domestic moments carved into the walls "featuring Wahtye ... and his family, in addition to scenes depicting the manufacturing of pottery and wine, making religious offering, musical performances, boats sailing, the manufacturing of the funerary furniture, and hunting." 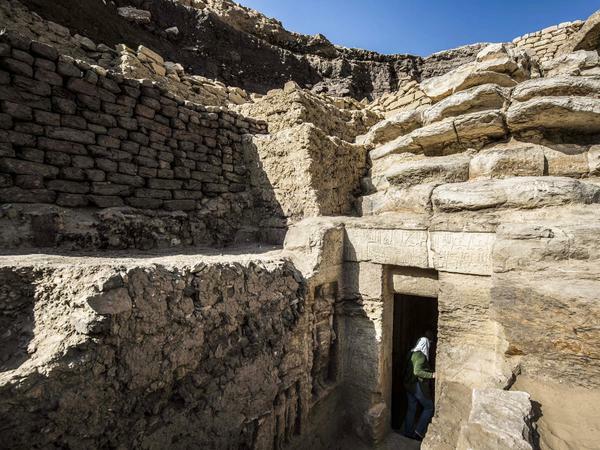 As NPR's Sasha Ingber has reported, Egyptian discoveries such as the one announced Saturday are both an archaeological achievement and a public relations coup – new finds can attract visitors to the country, still recovering from a slowdown in tourism caused by political unrest. Another Fifth Dynasty tomb, one that belonged to Hetpet, a priestess to the goddess of fertility Hathor, was revealed in February. And last month, Egypt's Ministry of Antiquities announced the discovery of 100 wooden feline statues and dozens of mummified cats.